ELKHART LAKE, Wisc. 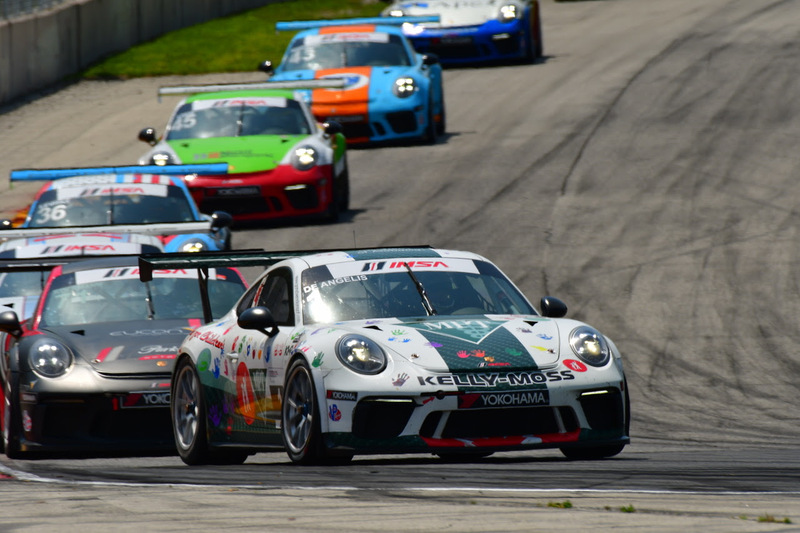 (6 August 2018) – Survival was the name of the game for Kelly–Moss Road and Race (KMR), as the team battled through an up-and-down weekend in its home race at Road America. 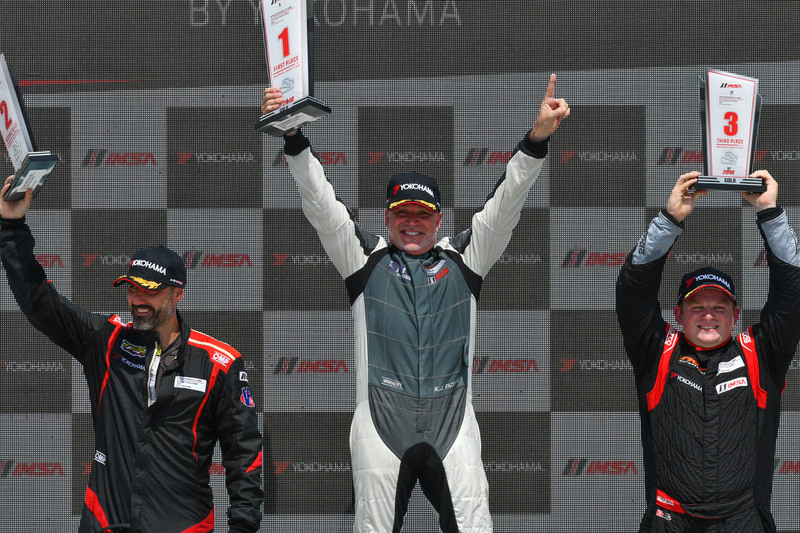 While not earning all the results to match the effort, the team continued to stay close in three championship battles in the IMSA GT3 Cup Challenge by Yokohama races. Rounds 9 and 10 of the series were eagerly anticipated by the Wisconsin-based team, with the opportunity to compete in front of over 125 family and friends a mere 100 miles from their Madison headquarters. Celebrating its 30th anniversary in professional motorsports, KMR arrived at the home track with an impressive stable of five cars: three entries in the Platinum Cup class (featuring the latest generation 2017 and 2018 Porsche 911 GT3 Cup car), including the No. 1 Racing for Children’s/MTP/Fortis Porsche of Roman De Angelis, Alan Metni in the No. 99 iFly/VICCI Car Auctions/AM Motorsports Porsche, and the No. 61 of Scott Welham (with Metni and Welham classified in the Masters category), and two cars in the Gold Cup class for Porsche model years 2014-16: Greg Palmer in the No. 44; and Kurt Fazekas in the No. 52. Coming off double podiums for De Angelis, Metni and Fazekas at Watkins Glen, and with each lying second in their respective championship standings, all three drivers approached the 4.048-mile iconic road course looking for both wins and points. Air temperatures hovered near the 90-degree Fahrenheit range (with track temps over 100F) as the green flag fell on Saturday’s 45-minute, 19-lap race. The action was as hot as the weather, as the 17-year-old De Angelis, starting sixth, battled to third on Lap 2, ahead of championship leader Trenton Estep, and began reeling in Anthony Imperato in second as the race progressed. Metni, starting second in the Platinum Masters class, executed a perfectly-timed pass on class (and championship) leader Charlie Luck to take the class lead. The race was shaping up to be a formidable battle until a right front suspension problem brought him into pit lane for repairs on Lap 11. 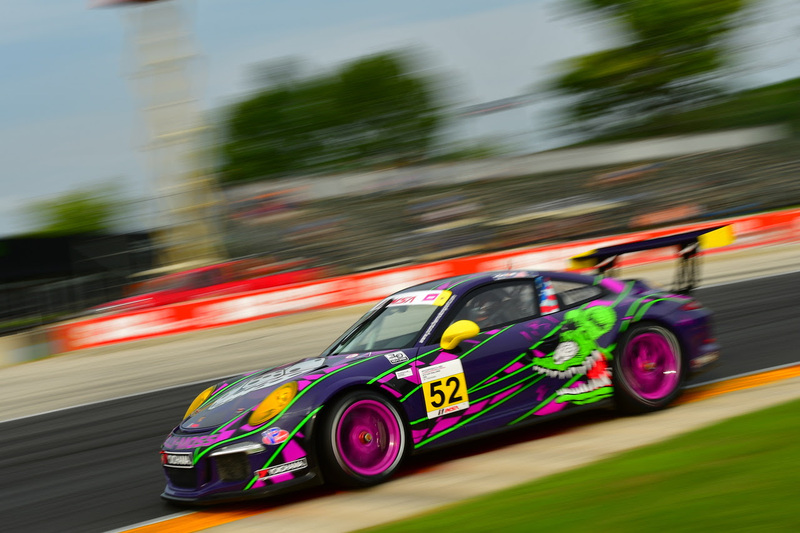 The KMR team, with help from Porsche Motorsports North America, made a lightning-fast repair to get Metni back into the fray late in the race. Rejoining the fray at the back of the field, Fazekas fought back through the field to close on the Gold Cup leaders and took advantage of a well-timed pass to take second on Lap 16. Palmer made a steady advance forward into fourth position from a seventh-place starting position. Coming back from the full course caution, the top five in Platinum Cup bunched up at the front of the field, with each vying for the same racing real estate. De Angelis had to check up twice behind Imperato, allowing Estep through and leaving De Angelis in fourth behind race winner Zacharie Robichon. 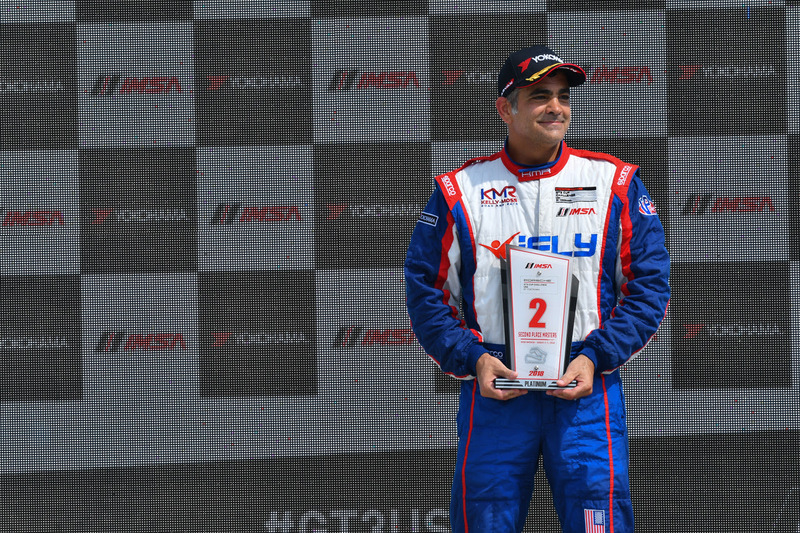 At the front of the Gold field, Fazekas made the comeback complete with a stellar pass for the class lead to take the top spot in Turn 14 and bring home his third win of the season. Unfortunately for Welham, his race ended when a car spun in front of him and made contact and was sent hard into the Armco in the Kink with two laps remaining, causing significant damage to the No. 61 Porsche. Welham was not injured as the race ended under caution, but the car was too badly damaged to return to action Sunday. In Sunday’s 45-minute, 21-lap, caution-free race, De Angelis started fifth and fought hard early to remain with the lead train. On Lap 17, he ran side-by-side for three corners with Imperato, making the pass stick in Turn 3, but was unable to reach championship leader Estep, who finished third. Metni also battled in the middle of the six-car Masters class until Lap 9, when he tried to make a pass on David Baker running wide in Turn 7, only to have Baker come back across the racetrack and force Metni into the grass. The incident earned Baker a drive-through penalty and moved Metni into third position. On Lap 16, Metni took advantage of Fred Poordad’s wide run in Turn 3, moving into second behind championship leader Luck. In the Gold Cup class, Fazekas did a masterful job of holding onto the car after getting forced into the grass in the Kink on Lap 1. However, the wild ride damaged the front spoiler, affecting the handling of the No. 52 Porsche, and Fazekas was unable to contend for the lead. Palmer once again had a steady fight in the early going, making effective passes and moving up from his seventh-place qualifying position into fourth mid-race, settling for fifth at the checkered but happy with his performance in only his second year of racing. As the season winds down, De Angelis, Metni and Fazekas remain focused on the championship fight, so to minimize the points loss on the weekend was key. While frustrated with his drive on Sunday, Fazekas focused on the positives from Saturday’s recovery, as Palmer continued to improve. 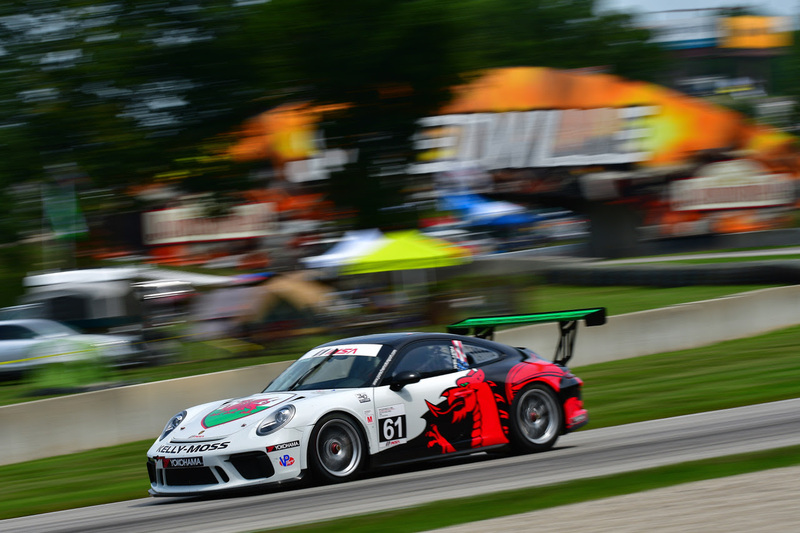 Team owner Jeff Stone was grateful to the family and friends who journeyed to Road America to watch the team race and vowed to continue the fight for the championship titles. 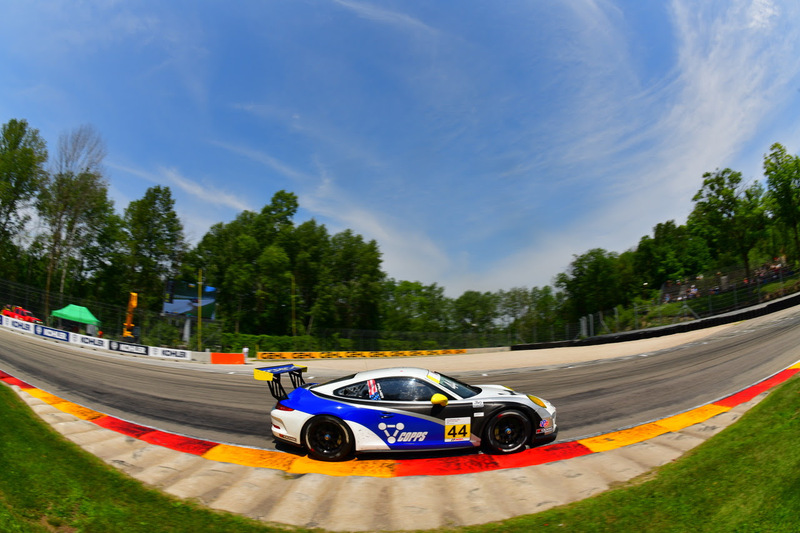 Next up for KMR will be Rounds 11 and 12 of the IMSA Porsche GT3 Cup Challenge by Yokohama at Virginia International Raceway, part of the WeatherTech SportsCar Championship weekend August 17 through 19.